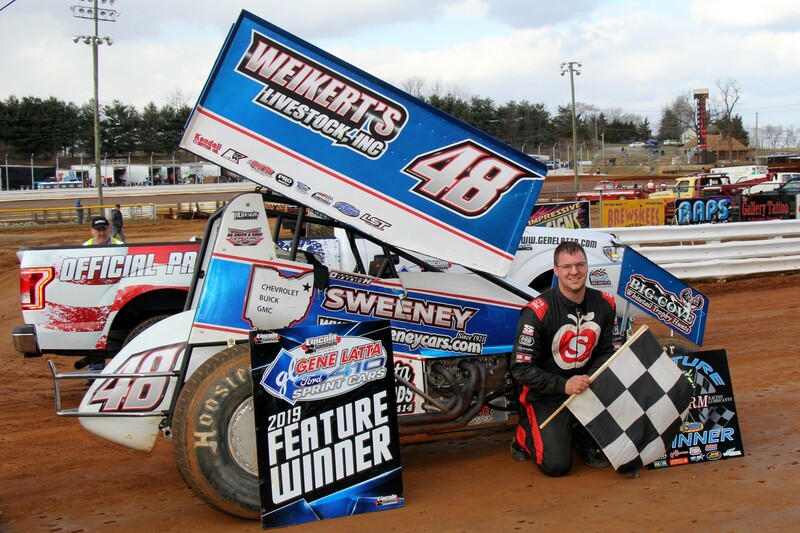 Abbottstown, PA (March 16, 2019) – Danny Dietrich wowed the crowd with a last lap pass to earn his first victory of the young 2019 season. Dietrich started on the pole of the 25-lap feature, but this was not an easy win for the pole-sitter. Dietrich shared the front row with Anthony Macri. Danny got a good jump on the start and took the high side around the track, but Landon Myers spun out in turn one setting up the field for a complete restart. Dietrich went to the high side again on the restart to take the lead. Dietrich and Macri were pulling away from the field as they hit lapped traffic on lap 5. Macri got to the top of the track coming out of turn 4 on lap 6 and it was a drag race to the flag stand for the lead with Macri as the victor. Spencer Bayston brought out the second caution of the race on lap 9 when he came to a stop in turn 4. Bayston was the first driver with the opportunity to take advantage of a new rule revealed at the driver’s meeting earlier in the afternoon. Lincoln Speedway officials are giving driver’s two minutes in the work area after a caution in the heats, consolation races and features, if they have not crossed the half-way point of the race. This is on par with the regulations during World of Outlaw and All-Star Circuit of Champions races. Bayston initially pulled parallel to his pit stall indicating he wanted to the two minutes, but after a once over by the crew they nosed the car in. When the caution came out on lap 9 Macri had put two lapped cars between himself and Dietrich. With the single file restart, Danny was right back in the race with Anthony. While Dietrich and Macri were battling for the lead, Ryan Smith was making his way through the field from his sixth starting spot. Smith got around Scott Fisher for third on lap 11. On the next lap, Fisher got into the wall in turn 2 bringing out the third caution of the race. Fisher had extensive damage to the front and rear of his car, ending his day. Dietrich went to the bottom of the track on the restart in an attempt to get by Macri for the lead, but it did not work and almost cost him second place as Smith nearly got by him in turns 3 and 4. Danny started closing the gap to Macri as they caught the tail end of the field. Dietrich tried to get under Marci on lap 17 in turns 3 and 4 to no avail. As the leaders worked their way through lapped traffic Dietrich and Smith put on a great show as they battled for second. Dietrich caught up to Macri on lap 22 with Smith joining in on the fun on lap 23. Danny made the move of the race with a slide job for the lead in turns 1 and 2 on the last lap. Smith followed and earned a second-place finish for the second week in a row. Macri crossed the line third. Chase Dietz finished fourth with Freddie Rahmer completing the top five. 410 Sprint Car heat winners were Scott Fisher, Anthony Macri and Danny Dietrich. Adam Wilt won the consi. Zachary Settle started on the pole of the 20-lap legend feature with Alex Robinson on the outside. Bill Diehl and Jeremy Hahn made up the second row. Settle led the first lap with Diehl and 5th place starter, Jeremy Ott close behind. Diehl and Ott went three-wide with Settle for the lead with Diehl darting out to the lead on the lap two. With Diehl in the lead the first caution of the race came out on the second lap as Austin Bellamere came to a stop in turn 2. Diehl held onto the lead on the restart with the pole-sitter, Settle, getting shuffled back to 5th. While Diehl was leading the field sixth place starter, Harlon Leppo, was working his way to the front. Leppo nearly got around Ott for 2nd on lap 4. Harlon made the move to take 2nd on the next lap by working the bottom of the track. Lap 6 saw two simultaneous drag races down the back stretch. One for 1st between Diehl and Leppo and the other for 3rd between Ott and Mason Chaney. The second caution flag came out on lap 7 as Travis Beck came to a stop in turn 4. Leppo made a run for the lead on lap 10 and almost had Diehl at the flag stand. Harlon made it stick a lap later in turns 3 and 4 and took the lead from Bill. Looking at the lap leaders one might assume Leppo took the lead and never looked back, but that was not the case. Diehl stuck around and did not make it an easy victory for Leppo. Travis Beck fell off the pace of the field with a spin out in turn 4 but was able to keep his car running. As the leaders caught Beck, Diehl took the lead back from Leppo on lap 15 as Leppo got caught behind Beck going down the front stretch. Diehl and Leppo were racing wheel to wheel on lap 16 for the lead with Leppo finally getting the advantage off turn 4. Diehl was still sticking around. Leppo blocked Diehl’s line coming out of turn 2 with two laps to go, preventing Diehl from taking the lead back. The final caution of the race came on lap 18 for a four-car pile up in turn 4. Chuck Dell, Chandler Pagnotta, Tim O’Sheehan and Zach Smith were involved. Diehl tried the top line on the restart but could not get around Leppo for the lead. It was a drag race to the finish with Leppo edging out Diehl by .463 seconds for the victory. Ott finished third. Chaney crossed the line fourth with Settle rounding out the top five. Legend heats were won by Bill Diehl, Jeremy Ott, Alex Schmiedel and Mason Chaney. Josh Schrum and Austin Bellamere each earned a Legend consi win. Next Saturday, March 23, Lincoln Speedway is back in action with 410 & 358 Sprint Cars. Racing starts at 6PM with pit gates opening at 3:30PM and grandstand gates opening at 4PM. 410 Sprint Feature (25 Laps) – 1. 48-Danny Dietrich ($3,500); 2. 72-Ryan Smith; 3. 39M-Anthony Macri; 4. 75-Chase Dietz; 5. 51-Freddie Rahmer; 6. 21-Brian Montieth; 7. 59-Jim Siegel; 8. 70-Brock Zearfoss; 9. 1X-Chad Trout; 10. 99-Kyle Moody; 11. 88-Brandon Rahmer; 12. 39-Cory Haas; 13. 24-Lucas Wolfe; 14. 15-Adam Wilt; 15. 2W-Glenndon Forsythe; 16. 0-Rick Lafferty; 17. 11-Dale Blaney; 18. 67-Justin Whittall; 19. 19m-Landon Myers; 20. 12-Brent Shearer (DNF); 21. 69-Tim Glatfelter (DNF); 22. 87-Alan Krimes (DNF); 23. 21T-Scott Fisher (DNF); 24. 70X- Spencer Bayston (DNF) No Time. Central PA Legends Feature (20 Laps) – 1. 15H-Harlon Leppo ($300); 2. 53-Bill Diehl; 3. 10-Jeremy Ott; 4. 8CR-Mason Chaney; 5. 58Z-Zachary Settle; 6. 5-Scott Houdeshell; 7. 19-Travis Perry; 8. 18H-Jeremy Hahn; 9. 95-Alex Schmiedel; 10. 30-Alex Robinson; 11. 93-Brent Marquis; 12. 94-Greg Burd; 13. 5C-Josh Schrum; 14. 26-Shaun Abney; 15. 18J-Jorjie Sweger; 16. 31-Travis Beck; 17. 75-Chandler Pagnotta (DNF); 18. 41-Chuck Dell (DNF); 19. 00-Tim O’Sheehan (DNF); 20. 78-Zach Smith (DNF); 21. 0-Blaine Leppo (DNF); 22. 30K-Seth Kerchner (DNF); 23. 51-Travis McClelland (DNF); 24. 8A-Austin Bellemare (DNF) No Time. Central PA Legends Heat Three Finish (8 laps) – 1.95-Alex Schmiedel; 2. 93-Brent Marquis; 3. 30-Alex Robinson; 4. 30K-Seth Kerchner; 5. 31-Travis Beck; 6. 88-Don Butler; 7. 1-Eugene Drew; 8. 83J-James Snow; 9. 0-Blaine Leppo; 10. 77A-Don Butler; 11. 13-Ron Blizzard Jr.